Properties in Arorangi District average 4.5 out of 5 stars. 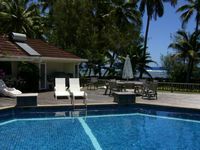 Property 9: Private well-equipped house: pool+garden+sunsets! 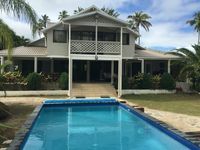 Stunning 2 bedroom Villa locating in beautiful Arorangi! Property 34: Stunning 2 bedroom Villa locating in beautiful Arorangi! Loved the pool, loved the beach, loved the blue tiles :-) Will have to make it back there one day. The property was great, with a good layout inside. It was well equipped with gear which we could use and also aircon and the pool were necessities in the heat! We were all very impressed with the location as well. The owner does live on the property, he was friendly and gave us good advice on activities we could do. They are very strict with the 10.30pm no noise policy, so I would only not recommend if you are intending on staying up for a few drinks past this time.